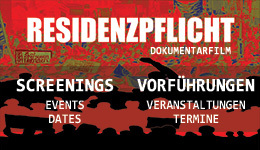 In my opinion we should do more to see the struggles beyond political socialization without clear positions for public interest in our protest against the deportation regimes and with deep reflection on the deportation culture of the German / European citizens beyond the the political establishment of any party in Europe. Racism is the "subjugation" of the Black Africans worldwide that was exceuted by the European elites with their racist education. The gravity of racism is beyond just selections and discrimination. Racism was the "iron gate" to genocide and extinction of the Black race that led to the deaths of millions and slavery which were continued with colonial occupation. "Is the AfD an alternative anti-deutsche? For their anti-Muslem movement to compliment their pro imperialist crusade" We need an answer. I do welcome any comment on my critics, your contribution and your analysis of the crimes of deportation and racism for the "refugee black box" manifestation. This text is not intentionally written to undermine nor to discredit the solidarity with refugees but we have a choice to empower the autonomous struggles of the refugee / oppressed communities in anywhere they are organized.